HDMI2USB is a device to capture HDMI and DVI (and Displayport with cheap active adapters) and send it on USB port as UVC video. The device attaches computer as a standard webcam so there is no need of installing additional drivers. More information about the device can be found in the wiki @ https://github.com/timvideos/HDMI2USB/wiki. Updated the HDMI2USB variant spreadsheet with new Numato board pin out. 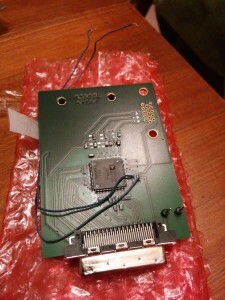 Successfully generated a HDMI2USB firmware for Numato board with new pin information. That fixes the constraint issue! Successfully generated a HDMI2USB firmware for Numato board with second receive port (RX2) disabled! Was able to view the HDMI2USB test image output on TX2! 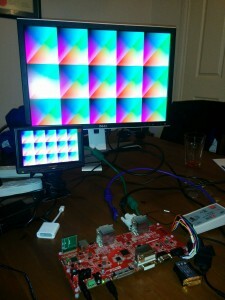 Was able to capture the HDMI2USB test image via mplayer! 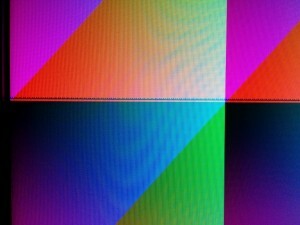 Was unable to detect a screen on RX1. Created a “flash.sh” script to use libFPGALink to flash the FPGA and then load the Cypress firmware. Wrote a Python script to interrogate the CDC serial port for status of the firmware. Setup xob‘s hacked up colormake in our build system. Nice colorized output now! Watched Paul Fenwick’s OSCon Keynote. Made the configuration system better and adding a lot of comments to the json file (which isn’t really valid json any more). Made pycon2internal.py slightly better and able to parse PyOhio format (based on the PyCon US format). Added hack to make event2internal.py to use pycon2internal.py at some periods. Set up a bunch of encoders in the Oregon EC2 region. Get access to www.timvideos.us again and deployed the updated website. Went into the Adelaide Hackerspace and created a cable to interface the USB3300 ULPI chip to 2xPMOD headers. Got streaming working for day 1 of PyOhio, it was late as we were disorganised. aps-sids foolishly pointed out a bug in the title of the streaming system, so I taught him about how we actually flumotion for an event. Added half bank / BUFIO2 regions. Added dedicated clock pin information. Started work on reshuffling the pins to fix the timing issue. Helped aps-sids get Flumotion working on the latest Twisted release. Turned out that someone else had already done most of the work and only a couple very small fixes where needed. aps-sids reported that he was now able to run flumotion on Ubuntu Trusty! Generally slow progress today, but some success. Able to successfully load libFPGALink firmware onto Cypress chip and programmed the FPGA using it. Yay! Wrote a test firmware based on http://hamsterworks.co.nz/mediawiki/index.php/DVI-D_Serdes to transmit 720p output from both the TX ports. Images are successfully received on both devices but there is a weird artifact in the image. 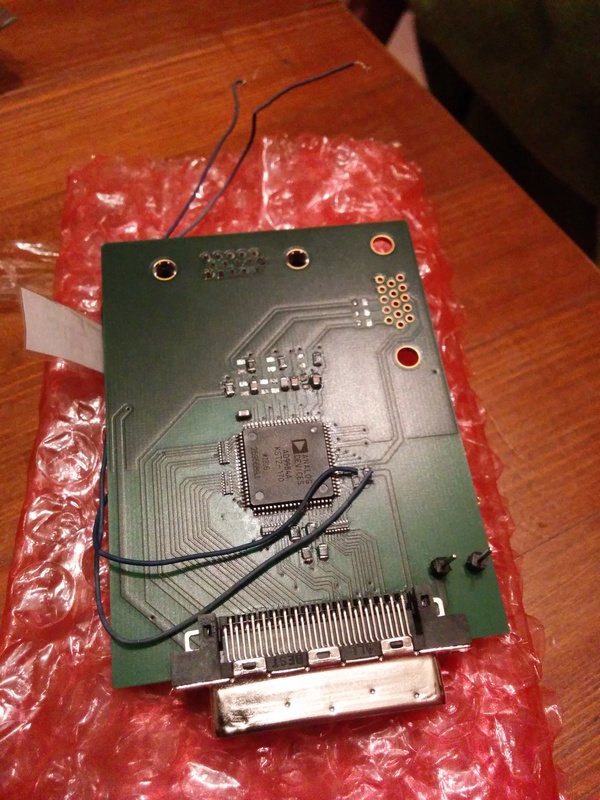 Rohit’s VGA expansion board was received, but yet to turn it on. Looking forward to seeing that working live! Tried to figure out where www.timvideos.us was hosted. 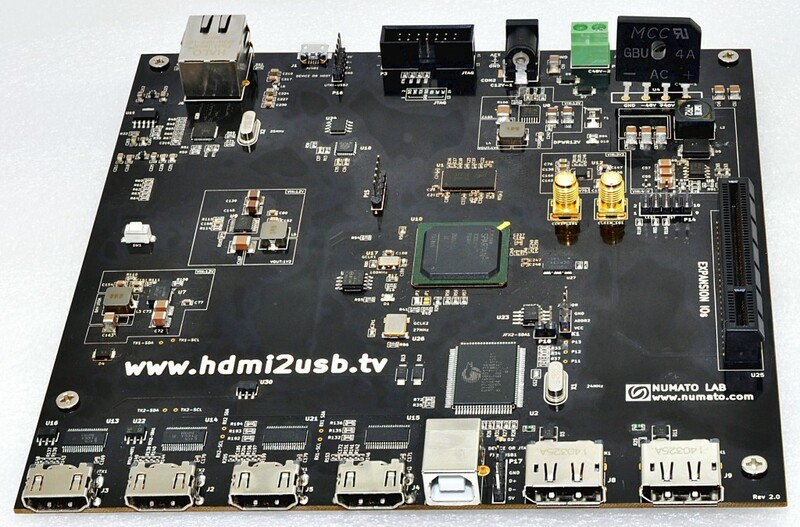 Two weeks ago I decided that I was going to take a week of work and spend it full time working on bringing up the HDMI2USB Production board that I’m working on creating with Numato. Since I’m making all our GSoC students do daily snippets, I thought it would be good for me to do snippets too! Will be good to look back on the week and see what I ended up actually doing. Organising issues related to GSoC2014. Found a bunch of pull requests from the start of GSoC that hadn’t been merged and looked at merging them. Created a spreadsheet which compares the production board to the Atlys prototyping board and will be used for tracking all HDMI2USB variants into the future. Created a document proposing a future directory structure for HDMI2USB firmware to allow multiple boards, interfaces and other features. Organised with Rohit to get a VGA capture board during this time. Probably a bunch of other stuff I have totally forgotten. Finished a bunch of paid work. Flew to Adelaide. Joel picked me up from the Airport. Started work on using ‘git-filter-branch’ to extract our PTZ and speaker tracking modules out of the gst-plugins-bad repo into a normal plugins repository while preserving history. Helped Joel get IPv6 working at his place. Fixed up IPv6 on home server to allow VMs public access. Started up the slidelint website VM and got it a working public IPv6 address. Set up a Ubuntu Precise VM to help test aps-sids flumotion porting work. Day off. Spent day playing DOTA 2 and StarCraft 2 with Joel’s mates. Concentrated on getting slidelint website up and running, targeting announcement at PyCon AU. Created DNS configuration and deployed it. Also updated the domain tracking spreadsheet. Rewrote the setup documentation (and ported it to Markdown). Set up a nginx frontend. Attempted to get circus-web interface working. Turns out it doesn’t work under Python 3 as torandio2 is unmaintained. Found the tests don’t work.